Ciao! I'm a film producer from the USA, currently heading to Indonesia to start filming the new film "il Vespista" based on the life of world scooter traveler, Giorgio Bettinelli! 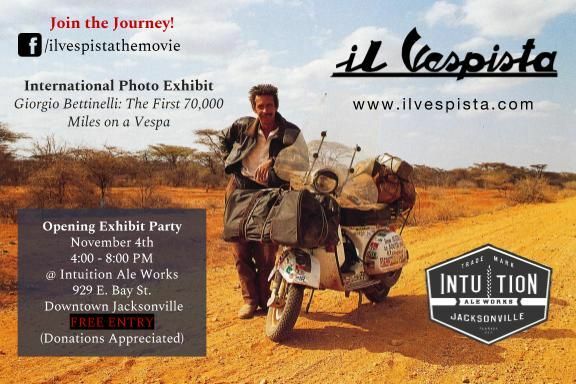 I'm holding a free photo exhibit in Jacksonville, Florida, Nov. 4th @ Intuition Ale Works. The exhibit features photos from Giorgio's travels around the world on a Vespa. If you or your club would like the exhibit to travel to you next, I can send you all 53 color photos with captions with a nice display banner. It's a great event to hold to draw a crowd, and it helps spread the word about our film. We are trying to raise money for our film, so we are asking for a donation of $350 + shipping to help cover the cost of printing and preparing the photos. We would then offer you credits in our film as sponsor too!